The LEED-NC Gold Audrey B. Morgan and Deerfield Halls are nestled between the campus core and the bordering forest. The buildings succeed in defining and creating a residential place for students to call home, amidst a 26,000-acre campus. With each approximately 50,000 square feet in size, the buildings include a total of 350 beds in a traditional college living style to encourage interaction among residents. Students share bathroom facilities with about 25 other residents within their wings. Public spaces—such as lounges, kitchens and laundry areas—have been designed with high quality finishes and hand-selected furniture. A central gathering place, known as the “jewel box,” is attached to Audrey B. Morgan Hall. Deerfield Hall is complemented by a large common area adjacent to a covered portal defining the central green. Several smaller lounges and social areas are distributed throughout each of the buildings. Berry’s incomparable campus provided an ideal setting for the creation of outdoor spaces that promote interaction. 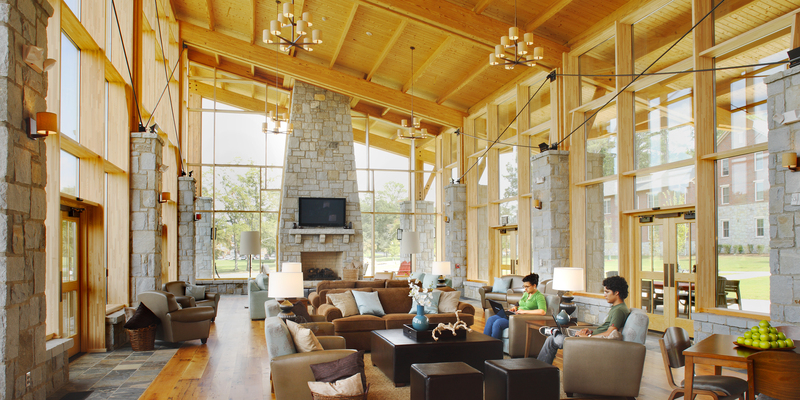 Indoor and outdoor fireplaces have become popular gathering spaces.The residence halls have achieved LEED-NC Gold certification and has been awarded the 2010 American School & University Educational Interiors Showcase, Silver Citation.